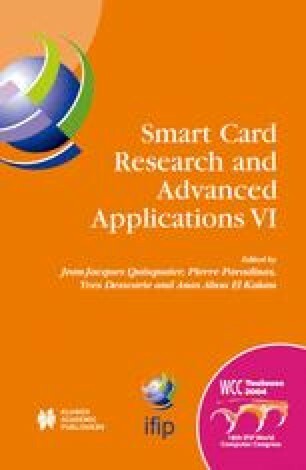 This paper covers the philosophy and techniques used for implementation of a standard networking stack, including the hardware interface, PPP, TCP, IP, SSL/TLS, HTTP, and applications within the resource constraints of a smart card. This implementation enables a smart card to establish secure TCP/IP connections using SSL/TLS protocols to any client or server on the Internet, using only standard networking protocols, and requiring no host middleware to be installed. A standard (unmodified) client or server anywhere on the network can securely communicate directly with this card; as far as the remote computer can tell, the smart card is just another computer on the Internet. No smart card specific software is required on the host or any remote computer. Dunkels, A. “IwIP-A Lightweight TCP/IP Stack.” More details are available at http://www.sics.se/~adam/lwip/. Lancaster, G., et al. uC/IP (pronounced as meu-kip) is an open source project to develop TCP/IP protocol stack for microcontroller. It is based on BSD code. For details, see http://ucip.sourceforge.net/. Freier, Alan O., et al. “The SSL Protocol, Version 3.0,” Internet Draft, November 18, 1996. Also see the following Netscape URL: http://wp.netscape.com/eng/ssl3/. Dierks, T., Allen, C., “The TLS Protocol, Version 1.0,” IETF Network Working Group. RFC 2246. See http://www.ietf.org/rfc/rfc2246.txt.